Usain Bolt has become a legend. He has won back-to-back Olympic gold in the 100 meters, the 200 meters, and the 4X100 relay. In addition to this accomplishment, Bolt holds the impossibly fast world record in the 100m of 9.63 seconds, making him the fastest man to have ever lived. Unless of course the stories about Achilles are actually true. Fleet-footed Achilles that legendary hero of the Iliad could run down anyone. 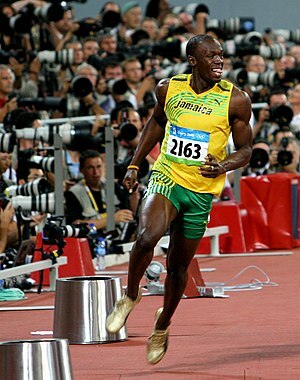 Besides speed, Bolt and Achilles have quite a bit in common. Both were self-proclaimed legends, supremely confident, and more than a little bit brash. As Bob Costas said last night, no one has a higher opinion of Usain Bolt than Usain Bolt. The same was true of Achilles. And they both have their side-kicks. Achilles had Patroclus; Bolt has Yohan Blake, friend, training partner, and the second fastest man alive. Patroclus exhorted Achilles to get his act together when the Trojans launched their offensive. Bolt said Blake told him that it was time to get serious after the Jamaican trials where Bolt didn’t run his best. Thankfully, Yohan Blake didn’t have to die to get Bolt back on track. He merely had to beat him in a couple of races. Finally, Achilles and Bolt both understand their own mortality. Both legends, yes, but both with brief careers. Achilles always understood that he would never live to see the end of the Trojan War. Bolt realizes that while his legendary status will endure, his speed will not. Bolt said last night that he’d like to run in the 2016 Olympics, but he’s not making any promises about medals. He’s done what he set out to do in classic Greek style (which means excellence without a shred of humility). Now the legend can pass the torch. « Time for a New National Anthem? Well said. I had similar thoughts while watching last night, and you articulated them well! Good points but the 100M WR is actually 9.58 .. 9.63 is the Olympic Record which he set recently. Thanks for the correction. Even faster than impossibly fast.